The Allen College Institutional Review Board (ACIRB) is a committee whose primary responsibility is to protect the rights and welfare of human subjects and to function as a kind of ethics committee focusing on what is right or wrong and on what is desirable or undesirable in projects involving human subjects. The ACIRB is registered with the U.S. Department of Health and Human Services Office for Human Research Protections (IRB00010298) and has Federal Wide Assurance for the Protection of Human Subjects for Institutions within the United States (FWA00023846). Registration and FWA confirm that ACIRB meets or exceeds all federal requirements for registered IRBs and is eligible to accept federally funded projects for review. The ACIRB’s mission is to strive to prepare competent healthcare professionals to conduct research, evidence based practice projects, and quality improvement projects that meet or exceed the ethical principles presented in the Belmont Report Respect for Persons, Beneficence, and Justice on which federal IRB guidelines are based, and to scrupulously protect the rights and welfare of subjects involved in projects and research. Caring – ACIRB focuses on the three ethical principles in the Belmont report when reviewing projects and research to verify that vulnerable populations, levels of risk, and privacy/confidentiality issues are clearly addressed. Community – ACIRB address issues of Respect for Persons, Justice, and Beneficence when reviewing proposals, and includes a community perspective in the process. Integrity – ACIRB scrupulously adheres to ethical and professional values and behaviors and strives to ensure adherence to federal, state, UnityPoint Health, and Allen College policies and regulations pertaining to the protection of human subjects in any type of project or research involving human subjects. Learning – ACIRB consults faculty, staff, students, and external principle investigators, and provides direction for obtaining necessary and optional training related to the protection of human subjects. Quality – ACIRB strives to review all projects and research consistently and to adhere to ethical and professional values in the process. ACIRB will also strive to maintain reasonable and responsible time frames for reviews and to collaborate with faculty, staff, students, administrators, and external investigators to address issues in a proposal with the goal of reaching approval. All investigators and key personnel involved in projects or studies are required to complete approved training in the protection of human subjects. The ACIRB accepts training from the Collaboration Institutional Training Initiative (CITI) Program and the National Institutes of Health (NIH). Evidence of completion of other programs of training on protection of human subjects will be considered on an individual basis by the ACIRB. For detained information about required training, see the ACIRB Human Subjects Protections Webpage. Once training has been completed and the proof of training is submitted to the ACIRB, that documentation will be maintained for a period of five years from the date of completion (not the date of submission). After the five years has passed, training must be updated by taking an approved training course and submitting proof of training to the ACIRB. Guidance on completing and submitting applications for review of research or evidence-based practice/quality improvement projects is provided on the ACIRB Procedure for Submitting webpage. Students should work with their faculty project advisor to develop the proposal and navigate the application submission process. The ACIRB is responsible for ensuring that ethical principles are applied in any proposal submitted for review. ACIRB members can provide guidance on protection of human subjects, intellectual property, and other ethical issues that pertain to research or projects. The ACIRB oversees protection of human subjects, responsible conduct of research/projects, misconduct, and conflict of interest. The purpose of overseeing compliance is to ensure that all research and projects reviewed by the ACIRB are conducted with integrity and in compliance with Allen College, local, state, federal, and funding agency regulations for research. 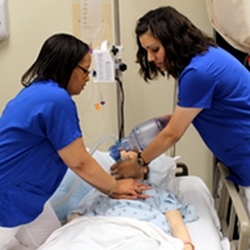 Whether or not a project or study is externally funded, any investigator who plans to do research or a project involving students, faculty, or staff of Allen College or patients and associates of Unity Point Health — Allen Hospital and its affiliated settings must obtain approval from the ACIRB prior to initiating the project or study.